Regional Operations Centers in Mid-Hudson Valley and Long Island Regions to Activate at 6 a.m. Saturday. 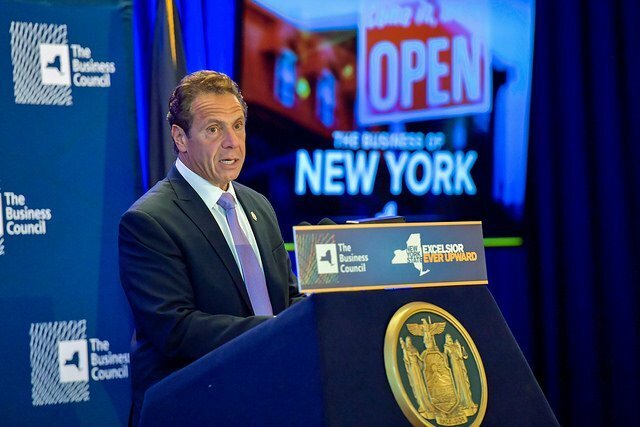 Photo by: Office of Governor Andrew M. Cuomo, via Flickr. Long Island, NY - October 26, 2018 - Governor Andrew M. Cuomo today announced the deployment of additional assets and personnel to the Mid-Hudson Valley and Long Island regions in advance of the coastal storm that will move into the state today and linger through much of the weekend, bringing with it rain, mountain snow and gusty winds. Rain will overspread most of the state with the heaviest rain in the lower Mid-Hudson Valley, New York City, and Long Island regions and snow in the highest elevations of the Catskills and Adirondacks. Downstate, heavy rain of one to two inches is expected late tonight through Saturday afternoon, with two to three inches possible across Eastern Long Island. Strong winds of 25 to 35 mph with gusts of 40 to 50 mph are likely late tonight through Saturday afternoon, highest along New York City and the coast, and 60 mph gusts are possible over the Twin Forks of Long Island. "Wet, windy and potentially snowy weather is on the way for the weekend and I have directed state agencies to prepare roads, personnel and supplies for possible hazardous conditions," Governor Cuomo said. "I urge all New Yorkers to make sure they are ready for winter weather and to begin preparing their homes, vehicles and businesses for whatever Mother Nature brings our way." A coastal storm is expected to impact the state over the weekend, with the bulk of the impacts occurring Friday night into Saturday. At this time, about one-half inch to one-and-a-half inches of rain is expected for most of upstate and downstate, heavy rain of one to two inches late tonight through Saturday afternoon, with two to three inches possible across Eastern Long Island. Accumulating snow is expected in the highest peaks of the Adirondacks and Catskills which may see one to three inches of snowfall with trace amounts up to around one inch possible. Easterly winds are expected to gust to 30 to 45 mph during the day Saturday, with the strongest gusts across the higher terrain of the Catskills and Adirondacks. The Long Island region will see a wind-driven heavy rain for late Friday night into Saturday afternoon across most of the region. A high wind warning has been issued for parts of Suffolk County for winds up to 30 to 40 mph with gusts up to 60 mph through Saturday afternoon across the Twin Forks of Long Island. Wind advisories have been issued for parts of New York City and Nassau County through Saturday afternoon for winds from 20 to 30 mph with gusts up to 50 mph. Strong winds may blow down limbs, trees, and power lines, and scattered power outages are expected. These stronger winds are likely to result in coastal flooding issues during times of high tide Saturday afternoon, and coastal flood warnings are in effect in the New York City and Long Island regions. At the Governor's direction, the Regional Emergency Operations Centers in Westchester County and Long Island will activate at 6 a.m. tomorrow morning and will be staffed by various members of the Division of Homeland Security and Emergency Services, Department of Transportation, Thruway Authority, Department of Public Service, Department of Environmental Conservation, Office of Parks, State Police, MTA/Metro North, Long Island Rail Road, Office of General Services, Department of Corrections and Community Supervision, Department of Health and the New York Division of Military and Naval Affairs. Additionally, the state's regional emergency stockpiles in the Mid-Hudson Valley, New York City and Long Island regions will be fully staffed beginning tomorrow morning. Forty-eight Department of Transportation personnel will be deployed to Long Island and the Mid-Hudson Valley from different regions across New York State, and these regions will be bolstered with two chipper crews comprised of 14 people, two tree crews comprised of six people, and two traffic signal crews comprised of four people. The Division of Homeland Security and Emergency Services has been in contact with Emergency Managers throughout the state and the State's Watch Center is monitoring for any potential issues. Additionally, the State's Emergency Operations Center will be activated at 6 a.m. tomorrow and will be staffed with OEM personnel to monitor the storm's impacts statewide. As some areas, including the lower Mid-Hudson Valley and Long Island, are expecting a large amount of rain, crews are clearing debris from drainage inlets and culverts while also readying plow trucks for snow and ice control. Subject: LongIsland.com - Your Name sent you Article details of "Governor Cuomo Deploys Resources to Mid-Hudson Valley and Long Island Regions in Advance of Strong Coastal Storm this Weekend"